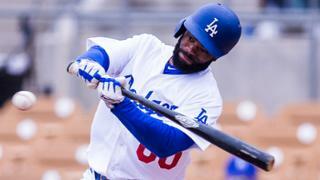 Andrew Toles hit a grand slam and Justin Turner followed going back-to-back with Toles in the Dodgers’ 11-6 victory over the Athletics. The A’s jumped on Rich Hill early when Matt Chapman hit a three-run home run in the first inning. They then added another run when Hill walked Alejandro De Aza with the bases loaded. Hill pitched 3 2/3 innings and was charged with four runs. He struck out six batters and walked four. The Dodgers loaded the bases in the fourth inning against A’s starter Jesse Hahn. Now, this usually means that the next batter will ground into a double-play, but this time Andrew Toles hit what looked like a hanging breaking ball for a grand slam. Justin Turner then followed with a solo shot as the Dodgers went back-to-back. After this, the A’s were never able to re-take the lead. Scott Kazmir will take the mound against the Texas Rangers in his first start since March 6. Kazmir has struggled with his mechanics and velocity this Spring. The game is located at Surprise Stadium in Surprise and will begin at 1:05 pm PT. Brandon McCarthy will pitch a minor league game on one of the Camelback Ranch backfields.